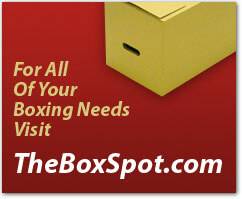 At The Box Spot, Consolidated Moving & Storage and movingToronto.com (hereafter referred to as movingToronto.com), we are committed to protecting your privacy. We use your information ONLY within movingToronto.com. In other words, to process orders, provide customer service, notify you of updates and scheduled maintenance, and to provide a more personalized online experience. and how do we use it? When you make requests or purchase products or other services online, we need to know your name, contact information, and (only if you decide to pay by credit card) your credit card number, and expiration date. This allows us to process and fulfill your order, and to keep you informed about your account and the services you are using. We also monitor customer traffic patterns and site usage, in aggregate, to help us develop the design and layout of the site to better meet users' needs. we collect to outside parties? No. We do not sell, trade, or rent personal information. movingToronto.com may provide aggregate statistics about our customers, sales, traffic patterns, and related site information to reputable third-party vendors, but these statistics will include no personally identifying information. movingToronto.com may release customer account information when we believe, in good faith, that such release is reasonably necessary to comply with law, to enforce or apply the terms of any of our customer agreements, or to protect the rights, property or safety of movingToronto.com, our customers and clients, our end-users, or others. This applies to your personal information as well as your data hosted by us. movingToronto.com will not use, sell, rent, trade or otherwise disseminate or disclose your data to either itself or any third party, except as required by law, or by your authorized written request or consent. For more information on our privacy and security policy please feel to contact us at anytime.